Pat Hastings-Burns, MS, LCDP, is the author of the award winning book Simply a Woman of Faith: How to Transform Your Life & Live in Spiritual Power. Pat is an internationally-recognized Inspirational Speaker, Workshop Leader, Retreat Leader, and Spiritual Life Coach. Pat is a licensed Certified Sacred Sexual Educator graduating from the Sacred Feminine Mystery School co-founded by Amrita Grace and Caroline Muir. Pat’s professional and spiritual background have equipped her to facilitate spiritual transformation in all women, no matter what their spiritual beliefs. Her message of love, hope, and transformation is universal. For all women who seek to be free of the holds of the past, and want to step into their power and potential, Pat provides powerful guidance and wisdom. Pat received her Master’s degree at Springfield College in Massachusetts, and has been a licensed Alcohol and Drug Therapist for over twenty five years. She is a certified Spiritual Life Coach and completed two years at the Spiritual Life Center in RI. She attended the Holistic Leadership Institute at Salve Regina University in Newport. Pat has been on her own spiritual path for over 40 years. In July, 2010 Pat was asked to speak at a local church about her journey of faith and because of that talk, her life changed DRAMATICALLY. In 2012, she left her family, friends, business to follow her heart and move 3000 miles away to Maui, Hawaii. She has been living her dream and living in Maui since January, 2012. She is presently leading retreats on the divine feminine and conducting workshops on radical manifestation. 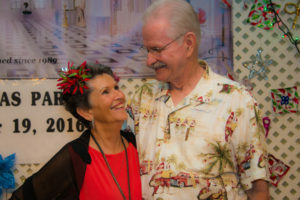 She met her soul mate, Larry, while dancing and they were best friends for 2 1/2 years before Pat realized that Larry was not only her best friend, but her beloved soul mate. He asked her to marry him at Christmas 2016 and they were married May 13th, 2017. Pat and Larry are writing a book together on Love. Simply a Woman of Faith is the story of one woman’s ability to overcome great obstacles and who at one time, was filled with fear and self hatred due to childhood sexual abuse. It is my story and the journey I have taken which taught me to have faith and courage, believe in synchronicities and trust- trust in a Power greater than oneself. I am a woman who chose Love instead of fear and who has been transformed from the inside out, and is now helping others to do the same. I don’t regret my past for it has truly made me the woman that I am today. My message and stories inspire readers to learn how to depend on God, ask for everything they need, trust in divine timing, open to God’s perfect plan and develop their limitless potential. My stories will make you laugh and cry, give you hope, and prove beyond a shadow of a doubt that you are loved and never alone. You will see that God is truly interested in all of the details of your life, if you are open and ask for assistance. My unique style and heartfelt honesty enable readers to see themselves in my story. Although each one of us has our own unique life’s journey, the feelings we all experience are always the same which readers can relate to, because I speak directly from my heart to theirs. Sharing my journey has helped thousands of people to see that they are never alone in their struggles, and even more, I have instilled in them the faith that if they trust the Power and Divine Source inside of them, they can change any circumstance and grow in their ability to love, forgive and triumph. 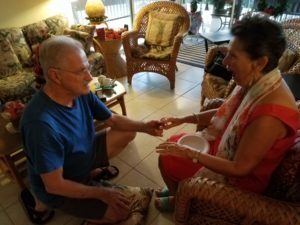 I invite people to go within and connect with their own Spirituality and life force.